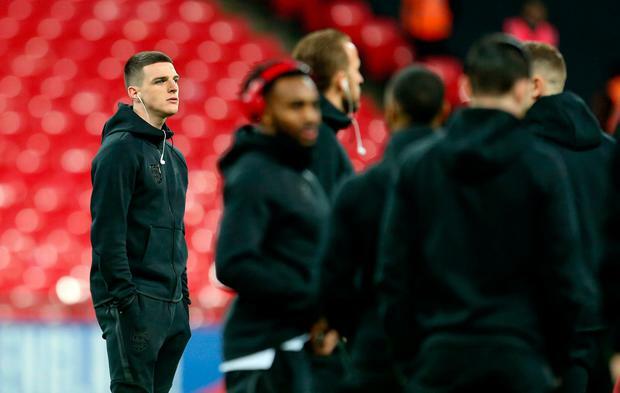 Jadon Sancho was handed his first England start for the Euro 2020 qualifier against the Czech Republic but newcomer Declan Rice had to settle for a place on the bench at Wembley. With the likes of Marcus Rashford and Jesse Lingard injured, Borussia Dortmund forward Sancho came into a Three Lions side showing five changes to the win over Croatia in November. Michael Keane, Harry Maguire, Jordan Henderson and Dele Alli came in as West Ham midfielder Rice and Chelsea's Callum Hudson-Odoi were named among Gareth Southgate's substitutes as they awaited their debuts.